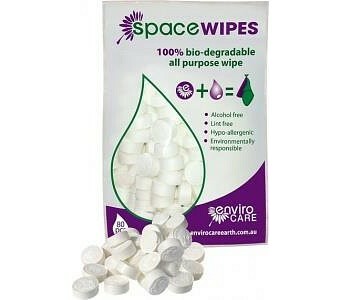 enviroCare Space Wipes offer the cleaning convenience of regular moist tissues plus a little extra – they’re dried and compressed to save space and weight. Just add a little water whenever you need one and watch it expand to a usable size. (Kids love it, of course, so it’s a great way of encouraging them to keep clean!) The hypoallergenic material is 100% biodegradable and free from chemicals like alcohol, parabens or benzalkonium chloride.